"That is murder. You're killing all these people." 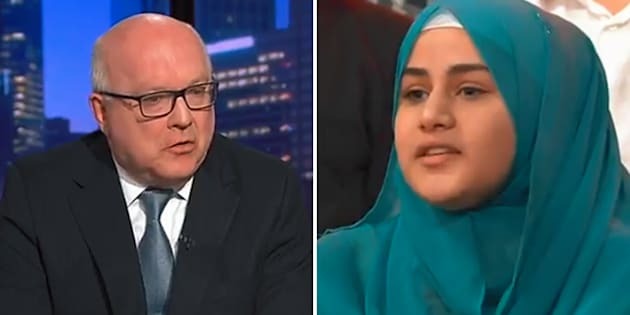 The Turnbull government was accused of murder on Monday night after Attorney-General George Brandis was confronted by a furious 'Q&A' audience member over the Coalition's handling of the current Manus Island crisis. Asked to address the young audience member's question over why the Turnbull Government is "so stubbornly refusing to accept New Zealand's offer" to resettle the men on Manus Island, Brandis began by saying that the matter is "an extremely difficult problem and it's not going to be solved by pieties or nice words." "The Manus Island offshore processing centre was opened as a result of an agreement reached between Kevin Rudd when he was the PM and Peter O'Neill, the PM of Papua New Guinea," he said. "Ever since the Coalition has been in government we have been trying to fix this problem and we started by stopping the boats and by stopping the boats we stopped the drownings. "People who play the humanitarian card, somehow always seem to forget about the more than 1,200 men, women and children who drowned at sea because the borders were out of control -- we stopped that." In response, the questioner launched a scathing attack on Brandis and the Coalition, suggesting his claims were hypocritical because "Australia's literally constructed based upon waves of immigration". "It is really funny to hear you have that audacity to come here and say you're stopping the boats. That is equivalent to saying you are killing all these people. That is not OK," she said. "You can hide behind the screens and everything but we see it as murder. That is murder. You're killing all these people." #qanda Brandis, you have had FOUR YEARS and the best solution you can come up with is to starve 100s on #Manus and thats "cleaning up the mess" ? More than 400 asylum seekers remain stranded at the Manus Island detention centre in Papua New Guinea after refusing to leave due to fears for their safety. The men, who have cited prior violence from locals, fear they will be subject to further danger if they leave the facility and have been surviving by drinking collected rainwater while also battling starvation, disease and a lack of medicine. Further to that, accusations have also emerged that the site where the Australian Government is forcing detainees to relocate to is reportedly inadequate for human habitation. Meanwhile, the Turnbull government has been refusing an offer made by New Zealand to take up to 150 of the detainees from the camp -- a refusal that has drawn widespread criticism, including from New Zealand Prime Minister Jacinda Ardern. Instead, Turnbull has continued to back a refugee swap deal that was agreed upon last year with the United States. On Monday night, politicians and commentators from both sides of politics reinvigorated pleas aimed at the government to accept the offer from New Zealand to spare the lives of the men. "George, please, we are better than this as a country... I spoke with a nun who was up there recently, people are committing suicide and can't get adequate medical protection because Papua New Guinea isn't set up. Manus Island isn't set up to provide it," Christian broadcaster and former Liberal politician Stephen O'Doherty said. "You are taking away people's humanity. We can't do that and hold up our heads as a nation that used to be proud to call itself a fair go nation." Greens MP Janet Rice also directed criticism towards Brandis on the matter, labelling the situation on Manus Island "a horrifying humanitarian emergency". "Those men need to be moved from there immediately. There are people that are dying -- we have been torturing these men," she said. "They are innocent people who sought our asylum and we have abandoned them... New Zealand is stepping up and those men should be off to New Zealand as quickly as possible because their lives are at stake. "Innocent people's lives are at stake. And it's on our conscience, what is happening there." The tense exchange also comes after it was revealed on Monday that New Zealand and Australia are in discussion about screening procedures for the men who remain in the Manus Island centre, however no progress has come in regards to where they may be relocated.